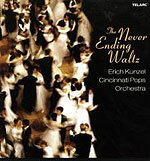 CD review: "The Never-Ending Waltz"
If out of fashion today as a bit stodgy, the waltz was once considered the height of daring and raciness. It was probably the first formal dance in modern Europe in which the couple touched while dancing. And if a bit slow compared to modern popular forms, the waltz's upbeat tempo made it the punk rock of its day. A new release from the Cincinnati Pops takes 44 of the best-known waltzes from more than a century's span and ties them all together into a single, 56-minute-long waltz. Conducter Erich Kunzel, the Arthur Fiedler of his generation, shows the late master's same light touch, leading the orchestra through the extended waltz with a relaxed yet fluid tempo. Kunzel also wrote the arrangement, tying all the different works together, and did so in a way that provides its own larger rhythms  faster passages bookended with slower, to create an interesting pace that holds your attention. While there are no breaks, the CD is divided into eight "tracks," with the short waltz passages arranged by various themes: those written by Johann Strauss Jr., waltzes from operas, waltzes from ballets, etc. The playing is glorious and grand; the recording quality pristine. The overall experience is of being transported back in time, to a huge ballroom with hundreds of swirling dancers.